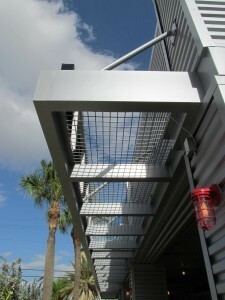 Consider the durability, enhanced appeal, and custom designs that come with a metal canopy. As a business owner, you may be looking for a way to extend your company’s brand story to the exterior of your business. Something that will enhance the look of your business and attract new customers as well as inspire the trust of your surrounding community. A metal canopy is a great solution to all of these desires. Whether you go big or would just like to add a feature that would make your business more distinguishable, a metal canopy from Carroll Awning Company would be the perfect choice. Consider the durability, enhanced appeal, and custom designs that come with a metal canopy. Metal canopies are structurally sound, and will give your business the official, credible, and dependable image that you want to project to the surrounding community. In addition to this look, the canopy will protect your customers and clients from harsh weather, including rain and even heat from direct sunlight. Your pockets won’t mind the benefits of your metal canopy either as it will also help regulate the temperature of your building, saving you money in energy costs. Potential customers and clients will be table to see the location of your business from a great distance with a metal canopy, in addition to attracting people that may have been headed elsewhere. Various styles include the hanger arm style, the plexus cantilevered look, or the motley metal and fabric design. This is especially helpful if your business is located in a business park or strip amongst a lot of other companies. Be distinguishable, professional, and contemporary. Make your metal canopy an extension of your brand with customized colors or with the aforementioned different styles. Add your logo, add you company’s specific color palate to make it completely your own. As it protects your customers from the elements, it also expands the overall function of your space and adds the possibility to do some outdoor outreach.